With more than 500 new features (and counting! 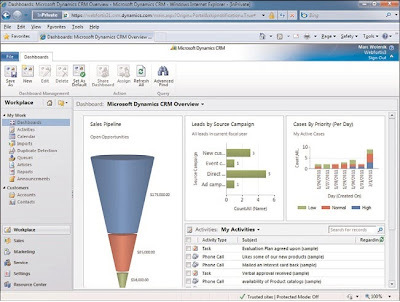 ), this release of Microsoft Dynamics CRM is very exciting. We have taken a handful of some of the best and newest features.To be honest, however, one of the best features isn’t even listed, and that is the parity that finally exists between the hosted version and the on-premise version of Microsoft Dynamics CRM 2011. In late January, Microsoft launched Microsoft Dynamics CRM 2011—to the cloud first! This was the first enterprise product from Microsoft that had its official launch as a service before there was a version you could purchase on premise. This shows that the application as a hosted service was ready for prime time.
. Data visualization outside of just Dashboards and in both Outlook and Internet Explorer referred to as Inline Visualization. New to Microsoft Dynamics CRM is the concept of connections. Different from relationships,connections allow for there to exist any type of relationship between virtually any other entity. NOTE: Relationships had been planned to be completely removed from this version (and only available if your system was upgraded to support backward compatibility). However, both Relationships and Connections are still available for use. A limitation of previous versions was the ability to only have activities that came with Microsoft Dynamics CRM out of the box (email, fax, phone call, and so forth). With this version, organizations can define activities and have them available just as they would with other activities. A great example of this would be to expand the Phone Call activity as shown in Figure 1.7 in which we have created Inbound and Outbound specific Phone Call activities. FIGURE 1.7 Custom activities for phone calls. The ability to create recurring appointments with the same type of scheduling engine from Outlook is now available. These appointments are very flexible, can be driven and modified with workflow, know when to cascade, and provide users with the ability to schedule recurrence for important events synchronized directly with their Outlook calendar. Previously available only with customization or by using the Sales Forecast Accelerator available from Microsoft/Codeplex, the concept of allowing the organization to track progress has been added to this version. Goals are extremely flexible and can be defined as not just something to be achieved against cumulative dollar fields/figures, but can also easily be defined to track the total number (that is, the count) of something—for example, the total number of cases closed by a customer service representative. Although workflows are still a part of Microsoft Dynamics CRM 2011, they are part of the concept of processes. Processes include both workflow and dialogs. Workflow is as it previously existed in Microsoft Dynamics CRM—the ability to automate events that do not require user input once started. Dialogs are interactive events that interact with users to provide a step-by-step interface for the management of a process. Figure 1.8 shows a typical dialog that can be used by individuals in customer service to troubleshoot a computer that won’t work. Processes are supported by Windows Workflow Foundation (WWF) version 4. Field-level auditing is now fully supported. Additionally, you can customize where you want auditing to occur. 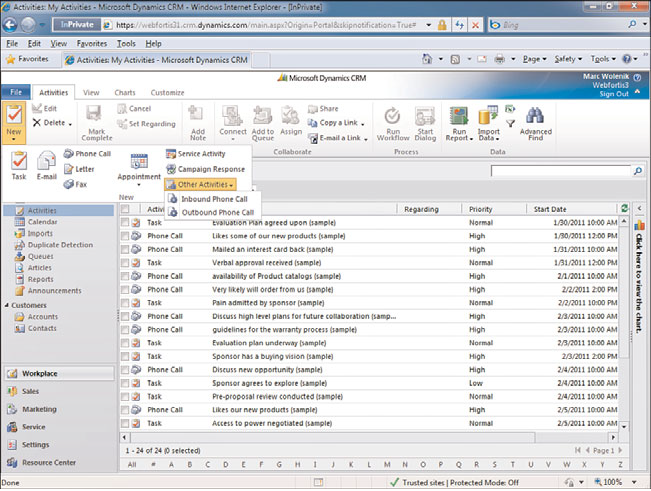 Auditing features for Microsoft Dynamics CRM 2011. Auditing captures the following: . Date and time something was changed . The old value . The new value . The individual who made the change . “Settings and Configuration,” for more information on working with auditing. Team Record Ownership Groups of people or teams can now own records. This is a hugely valuable feature that extends the concept of record sharing and ownership to allow multiple people to manage records at the same time. Field-Level Security Fields can now be hidden at the user level with no additional code required. The field security is defined by user and team; this is unlike record and form security, which is defined by role. With the first release of Microsoft Dynamics CRM 2011, field-level security is available only for custom attributes (that is, those you add to a form). System attributes cannot be set for field-level security. It is anticipated that Microsoft will release an update that will allow this feature to be included for all attributes. Field-level security is controlled through an added role feature called field security profiles.
. Information from the entity is available and can be configured to be displayed based on preference directly within Outlook.
. Visualizations or charts are available directly within Outlook.
. Conditional formatting options are available. Unlike in previous versions of Microsoft Dynamics CRM, Microsoft Dynamics CRM 2011 allows for marketing lists to be dynamic. What this means is that instead of having to create marketing lists as needed (typically right before they’re needed so as to have the most current data and segmentation available), users can define a marketing a list once and have new records that meet the criteria of the marketing list automatically added to the list. The concept of data augmentation is available and supported out of the box. Users now have the ability to export data, work with it directly in Excel, and then reimport the data. This feature is actually available for users of Microsoft Dynamics CRM 4.0 after applying Rollup 9+ by unhiding the columns exported. Microsoft Dynamics CRM 2011 now supports the concept of solutions. A solution is the ability to have different layers of customizations in a deployment. This will result in vast improvements for organizations that want to have a level of control over the customizations applied to a deployment, in that each customization set can be included into a single solution that is deployed and can easily be rolled back. Web Resources and Azure Integration . Additionally, customers can take advantage of the Marketplace and download solutions from ISV publishers and install them directly on their system for testing and usage.Mobility Supported out-of-the-box is the ability to access the information with any mobile client. The ability to reference resources such as web pages, JScript, or even Silverlight is now available directly through the application, versus in previous versions that required IFRAMEs. Leveraging other cloud applications or Azure can now be easily accomplished in Microsoft Dynamics CRM 2011. Document management leveraging Microsoft SharePoint is now fully supported. Using SharePoint for document management allows organizations to derive the benefits of SharePoint, including . Document versioning . Check in and check out . SharePoint workflow Additionally, hosted SharePoint – Microsoft Office 365 delivers all the integration options available with SharePoint as well.